As the parent of a 19-year-old son diagnosed with autism spectrum disorder (ASD), I know how difficult it can be to navigate the hospital environment. I have spent countless hours trying to get my son his medical care without him having tantrums due to the anxiety-provoking environment. The difficulties in this setting for children with ASD include loud noises, large buildings, unpredictability, lighting, and lack of activities they can do, especially during a long wait for an appointment. The Children’s Hospital of Philadelphia (CHOP) Patient and Family Engagement Team and Outpatient Services Leadership won a 2016 John Q. Sherman Award for Excellence in Patient Engagement for their Buerger Center Project. 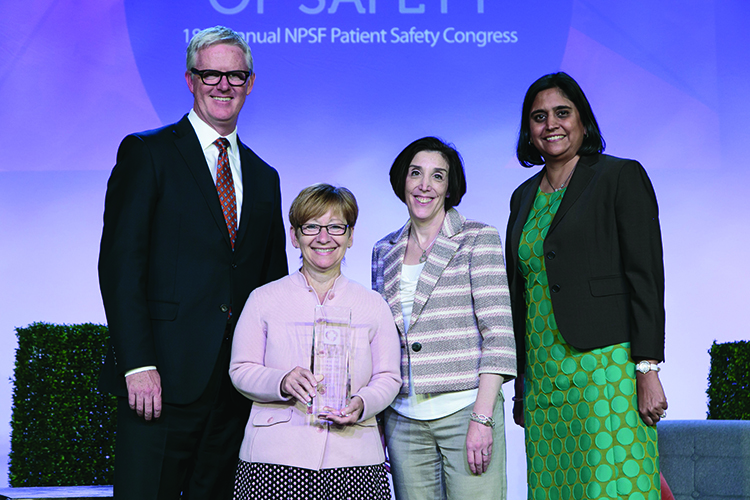 Amy Kratchman and Patricia Richards received the award on behalf of CHOP at May’s National Patient Safety Foundation’s Patient Safety Congress on behalf of CHOP at May’s National Patient Safety Foundation’s Patient Safety Congress in Scottsdale, Arizona. The award is sponsored by Taylor Healthcare and is presented in conjunction with the National Patient Safety Foundation. (l to r) Mark O’Leary, president Taylor Healthcare; Patricia Richards; Amy Kratchman; Tejal Gandhi, president and CEO, National Patient Safety Foundation. When The Children’s Hospital of Philadelphia (CHOP) designed a new outpatient building, families were included in the process at every step, from first-draft plans to the official opening of the Buerger Center in July 2015. In 2015, 17,821 children with ASD visited CHOP locations. The latest national prevalence rate for ASD is 1 in 68 children; the CDC reports that New Jersey’s ASD prevalence rate is 1 in 41, the highest in the country. CHOP has locations in New Jersey and is home to the Regional Autism Center and the Center for Autism Research. The CHOP team knew that to create an autism-friendly environment, they had to rely on the experts—the families. A group of families who have a child with ASD volunteered to provide feedback to the hospital. The Autism Family Partners are part of CHOP’s larger Family Partners Program, which comprises many subspecialty groups that collaborate with staff across the hospital to provide the perspective and voice of all patients and families. The Autism Family Partners are embarking on another project in the Buerger Center. Following an ASD parent suggestion, CHOP is creating a tip sheet to inform families about autism-friendly areas as well as active areas they may want to avoid if loud noises are a problem. In addition, the Family Partners are meeting with CHOP’s ASD clinicians to develop a guide to playful, ASD-friendly interactives that families can use as positive behavioral supports or rewards. The Buerger Building is one more example in CHOP’s long history of family-centered care. Partnering with families and including their voices in its work is how CHOP continually meets their needs. Amy Kratchman has been working with clinicians and researchers since 2008 as a family representative. She is the mother of three children with special healthcare needs. Kratchman is a family consultant at The Children’s Hospital of Philadelphia (CHOP) and co-leads Family Partners, an innovative program developed and implemented at CHOP to maximize the meaningful engagement of families in all aspects of the pediatric healthcare delivery system. 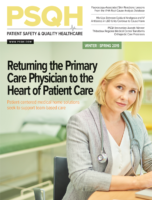 Kratchman is also a co-investigator on a PCORI Pilot grant, and co-investigator and family lead on the PCORI-funded National Pediatric Learning Health System (PEDSnet). She is the family advisor for the Developmental Behavioral Pediatric Research Network and the CHOP Autism Treatment Network, and recently served on PCORI’s Patient Engagement Advisory Panel. Kratchman is also a member of CHOP’s Patient and Family Care Council (PFAC) and co-chairs special interest PFACs. She may be contacted at KratchmanA@email.chop.edu.